Dermatomyositis (DM) is a rare inflammatory muscle disease that leads to destruction of muscle tissue usually accompanied by pain and weakness. Dermatomyositis is one of a group of three related diseases called inflammatory myopathies. The other two are polymyositis and inclusion-body myositis. These diseases are rare; only about 20,000 people in the United States have dermatomyositis. Another estimates suggest that DM occurs in about 5.5 individuals out of every one million. The disease is of unknown origin and can develop in children and adults. Most often individuals either develop DM either between the ages of five and 14 or they do not develop it until they are over age 45. In all age groups, females are twice as likely to develop the disease than males. Although DM causes pain and weakness, it is not necessarily life threatening. However, adults, but not children, who develop DM have an increased risk of developing cancer and should be screened for malignancies regularly. The exact cause of dermatomyositis is unknown. It is an autoimmune disease. In a healthy body, cells of immune system attack only foreign or defective cells in the body to protect it from disease. In an autoimmune disease, the immune system attacks normal body cells. In the case of DM, immune system cells attack healthy cells of small blood vessels in the muscle and skin. Over time, this causes muscle fiber to shrink and sometimes cuts off blood supply to the muscle. DM tends to develop in muscles closest to the center of the body. As yet, there is no clear explanation of what causes an individual to develop DM. It is thought that the disease may be triggered by a virus or exposure to certain drugs or vaccines. According to the Muscular Dystrophy Association, recent research suggests developing DM may be related to the mixing of blood cells that sometimes occurs between the mother and fetus during pregnancy. The disease is not directly inherited, although there may be some genetic sensitivity toward whatever triggers it. Often the first sign of DM is the development of a patchy, scaly, violet to dark red skin rash on the face, neck, shoulders, upper chest, knees, or back. Often the rash appears before any signs of illness or muscle weakness. About 40% of children and teens develop hard, painful bumps under the skin that are deposits of calcium, a mineral used in bone formation. This condition, called calcinosis, is much less common in adults. Muscle weakness, especially in the upper arms, hips, thighs, and neck, becomes apparent in activities such as climbing stairs or reaching up over the head. This weakness develops after the rash appears. Some people have difficulty swallowing and chewing when the muscles of the face and esophagus are affected. Individuals may also feel tried, weak, have a low-grade fever, weight loss, and joint stiffness. Some individuals have the rash for years before they progress to these symptoms, while in others the onset of symptoms is rapid. In children the development of symptoms is almost always gradual, making diagnosis especially difficult. DM can be difficult to diagnose, and often the first doctor an individual sees is a dermatologist for treatment of the rash and then is referred to a rheumatologist, specialist in internal medicine or neurologist when DM is suspected. Many tests may be done to rule out other diseases before a firm diagnosis is made. A blood test is done to measure the level of creatine kinase. Creatine kinase is an enzyme found in muscle tissue. When muscle is damaged, this enzyme leaks out into the blood. An increased level of creatine kinase in the blood suggests DM as a possible diagnosis. Another blood test may be done to test for specific immune system antibodies. Antibodies are proteins made in response to material the body thinks is foreign. An electromyogram (EMG) is a test that measures electrical activity in muscles as they contract. Individuals with inflammatory myopathies usually have distinct patterns of electrical activity in the affected muscles. However, up to 15% of people with DM have normal electromyogram readings, so this test is not definitive. The definitive test is a muscle biopsy. The doctor takes a small sample of muscle tissue and examines it under a microscope. From this sample, the doctor can differentiate DM from other inflammatory myopathies and other muscle wasting diseases. The goal of treatment is to improve muscle strength and allow the individual to participate in normal daily activities. Individuals are given steroid drugs (prednisone, corticosteroids) that suppress the immune system. Over time, these drugs often produce undesirable side effects, so treatment is usually begun with a large dose, then tapered to the minimum dose needed for maintenance. People who do not respond well to steroid treatment may be treated with other immunosuppressive drugs or intravenous immunoglobulin. Individuals with DM are advised to avoid exposure to the sun, as sunlight worsens the skin rash. Physical therapy is often helpful in keeping joints from stiffening and freezing. Moderate exercise is also recommended. A healthy diet high is recommended for all individuals with supplemental protein for those with severe muscle damage. The course of DM is highly variable. In about 20% of people, the disease spontaneously goes into remission and individuals are able to lead symptom-free lives for long periods. On the other hand, in about 5% of individuals the disease progresses to death because of heart and lung involvement. The majority of people continue to have some symptoms and require long-term treatment, but their degree of daily activity varies greatly. Serious complications from DM include involvement of the muscles of the heart and lungs, difficulty eating and swallowing, and a tendency to develop cancer. This association is seen only in adults and not in children. Individuals over age 60 are more likely to have serious complications than younger individuals. Koler, Ric A. and Andrew Montemarano. "Dermatomyositis." American Family Physician, 24, no. 9 (1 November 2001) 1565–1574 [cited 16 February 2005]. 〈http://www.aafp.org/afp/2001101/1565.html〉. American Autoimmune Related Disease Association. 22100 Gratiot Avenue, Eastpointe, East Detroit, MI 48201-2227. 800-598-4668. http://www.aarda.org. Myositis Association. 1233 20th Street, NW, Washington, DC 20036. 800-821-7356. http://www.myositis.org. National Organization for Rare Disorders (NORD). P. O. Box 1968, Danbury, CT 06813-1968. 800-999-NORD. http://www.rarediseases.org. Callen, Jeffrey P. Dermatomyositis, 5 December 2002 [cited 16 February 2005]. http://www.emedicine.com/derm/topic98.htm. Hashmat, Aamir and Zaineb Daud. Dermatomyositis/Polymyositis, 16 January 2004 [cited 16 February 2005]. http://www.emedicine.com/neuro/topic85.htm. Immunoglobulin — Material containing specific antibodies to fight disease that can be injected into an individual to fight infection. Inflammation — An infection or irritation of a tissue. Myopathy — Relating to muscle tissue. an acute, subacute, or chronic disease marked by nonsuppurative inflammation of the skin, subcutaneous tissue, and muscles, with necrosis of muscle fibers. It is in the group of illnesses known as collagen diseases. Among a variety of symptoms that point to the onset of the disease are fever, loss of weight, skin lesions, and aching muscles. As the disease progresses there may be loss of the use of the arms and legs. Complications such as hardening may occur, similar to the changes seen in scleroderma. Occasionally steroids prove helpful in relieving symptoms, but the most beneficial treatment is physical therapy to maintain maximal use of the muscles. A progressive condition characterized by symmetric proximal muscular weakness with elevated serum levels of muscle enzymes and a skin rash, typically a purplish-red erythema on the face, and edema of the eyelids and periorbital tissue; affected muscle tissue shows degeneration of fibers with a chronic inflammatory reaction; occurs in children and adults, and in the latter may be associated with visceral cancer or other disorders of connective tissue. /der·ma·to·myo·si·tis/ (-mi″o-si´tis) a collagen disease marked by nonsuppurative inflammation of the skin, subcutaneous tissue, and muscles, with necrosis of muscle fibers. A progressive inflammatory condition characterized by muscular weakness, a skin rash, and edema of the eyelids and periorbital tissue. a disease of the connective tissues, characterized by pruritic or eczematous inflammation of the skin and tenderness and weakness of the muscles. Muscle tissue is destroyed, and loss is often so severe that the person may become unable to walk or to perform simple tasks. Swelling of the eyelids and face and loss of weight are common manifestations. The cause is unknown, but in 15% of cases the condition develops with an internal malignancy. Viral infection and antibacterial medication are also associated with an increased incidence of dermatomyositis. Treatment of this disease may include prescription of predniSONE; immunosuppressants may be used in cases that are unresponsive to predniSONE. In order to prevent muscle wasting and preserve muscle function, physical therapy is required. Most cases respond to therapy, although the disease is usually more severe and treatment resistant in patients with pulmonary or cardiac issues. A collagen vascular disease caused by complement-mediated microangiopathic muscle fiber destruction, leading to loss of capillaries, muscle ischemia and necrosis and perifascicular atrophy Clinical Patches of reddish or scaly rash on bridge of nose, sun-exposed areas of neck, chest, dorsal hands, periorbital edema Risk of cancer ↑ Management Azathioprine, cyclophosphamide, cyclosporine, MTX, and prednisone are generally unsuccessful; high-dose IV Ig may ↑ muscle strength and ↓ neuromuscular symptoms in refractory dermatomyositis. See Polymyositis, Scleroderma. A progressive condition characterized by symmetric proximal muscular weakness with elevated muscle enzyme levels and a rash, typically a purplish-red or heliotrope erythema on the face, and edema of the eyelids and periorbital tissue; affected muscle tissue shows degeneration of fibers with a chronic inflammatory reaction; occurs in children and adults, and in the latter may be associated with visceral cancer. Dermatomyositis symptoms include fever, malaise, and weakness, esp. of the pelvic and shoulder girdle muscles, neck, and pharynx; skin and mucosal lesions (e.g., Gottron's papules), and joint discomfort. Performance of ordinary activities (getting up from a chair, combing one's hair, reaching above one's head, raising one's head from pillow) are affected. About one third of patients have dysphagia. Dysphonia and difficulty breathing also may be present, with death associated with respiratory disease, heart failure, associated cancers, or adverse effects of drug therapies. The disease progresses slowly, with frequent exacerbations and remissions, and occurs two times more frequently in females than in males. The prognosis worsens with aging. The treatment is symptomatic and includes bedrest, physical therapy, high-dose steroid therapy, and other anti-inflammatory agents. Cytotoxic drugs such as azathioprine, cyclophosphamide, and methotrexate are often beneficial in patients who do not respond to adrenocortical steroids. Analgesics are provided as necessary. Serum muscle enzyme levels and muscle strength usually improve after 2 to 6 weeks of vigorous therapy, allowing corticosteroid dosages to be gradually tapered down. The patient's level of discomfort, muscle weakness, and joint range of motion are assessed and documented daily. The patient's face, neck, upper back, chest, nail beds, eyelids, and interphalangeal joints are evaluated for rashes, and any findings are documented. Frequent assistance is provided to help the patient reposition in correct body alignment; appropriate supportive devices, frequent passive ROM exercises, and graduated exercises are used to prevent and treat muscle atrophy and joint contractures. Warm baths, moist heat, and massage are provided to relieve stiffness, and prescribed analgesics are administered. Oral lesions are irrigated with warm saline solution, as necessary. Tepid sponge baths and compresses are used to relieve pruritus and to prevent scratching; antihistamines are also administered as prescribed. Self-care activities, with assistance if necessary, are encouraged and paced according to the patient's response. Reassuring the patient that muscle weakness during exacerbations is temporary helps to ease fears of dependence. Prescribed corticosteroid, cytotoxic, or immunosuppressant drugs are administered, and the patient's response is evaluated. Both patient and family are educated about the disease process, treatment expectations, and possible adverse reactions to corticosteroid, cytotoxic, and immunosuppressant therapies. Good nutrition and a low-sodium diet are recommended to prevent fluid retention. The patient should be educated about the potential ongoing side effects of therapy (e.g., those associated with chronic, high-dose corticosteroids) and assisted to develop physical and emotional coping skills to deal with these. The patient is encouraged to express feelings, fears, and concerns about the illness; realistic support and encouragement are provided. A disorder affecting both skin and muscle. There is inflammation and degeneration of connective tissue causing a rash and progressive muscle weakness. The condition is thought to be an AUTOIMMUNE disorder possibly induced by a virus. n (polymyositis, dermatomucosomyositis) a form of collagen disease related to scleroderma and lupus erythematosus. The skin lesions are diffuse erythematous desquamations or rashlike lesions. The skin symptoms are related to a variety of patterns of myositis. an acute, subacute or chronic disease of humans, marked by nonsuppurative inflammation of the skin, subcutaneous tissue and muscles, with necrosis of muscle fibers. an inherited disease found mainly in Collies and Shetland sheepdogs. Starting at a young age, there is hair loss, alopecia, scaling, crusting and sometimes ulceration on the face, ear tips, pressure areas over the carpus and tarsus, and the tail. Myositis may be severe, causing a stiff gait, difficulty in chewing and atrophy, or be unrecognized except by biopsy. Q. Does my son have dermatomyositis? My son is 6 years old and he is very weak. He gets very tired after doing the simplest things like going for a walk. He also has a rash on his neck. What could this be? A. It doesn't sound like you have anything to worry about. The main warning sign of dermatomyositis is muscle weakness. Usually the first muscles affected are in the hips and thighs, though any other muscle in the body can be affected. It may be hard to climb stairs, get dressed or get out of bed. Pain in the joints between bones. Deep red (almost purple) rash, usually on the face, scalp, neck and chest. However, the rash can appear on any part of the body. · It may also be hard to swallow. If you have dermatomyositis you will have muscle weakness and will develop a rash, most often on your face, scalp, neck and chest. The rash can also appear on your hands and fingers (often the knuckles), elbows, knees, ankles, upper arms and thighs. 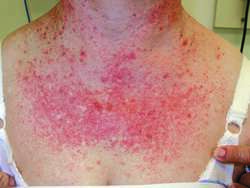 The rash is often deep red in colour (almost purple) and in some areas may be slightly raised. If your son's rash doesn't look like this then it could be caused by many other things, consult your Dr about it.